If an individual fails to meet the terms and conditions which were defined in the contract agreement that he signed, then he must be informed about the violation. This can be done by sending a 7-day notice form to give the violator some time in either submitting to the requirements of the notice sender or to inform the sender that he will prefer to terminate the signed contract. What Is a 7-Day Notice Form? 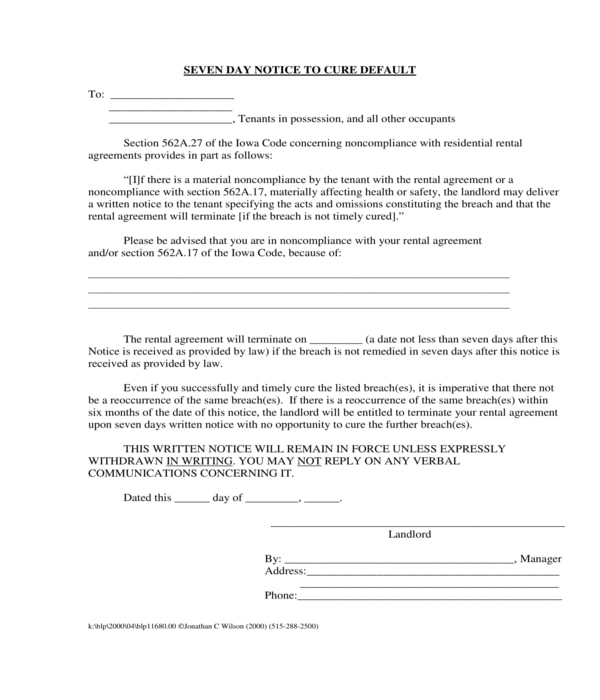 A 7-day notice form is a document which will be sent to a recipient to inform him about an activity that will occur seven days after he receives the notice. The sender will be able to explain the purpose of the notice form, and what must be done by the recipient within the seven-day period. The notice form can also be accompanied by other documents to prove the claims of the sender about the subject of the notice. 7-day notice forms are basically used for informing the involved individuals of an activity or an event, however, there are other reasons why 7-day notice forms are important. One is to meet the legal requirements of a state or country in lieu of a case or a legal preceding. Another reason is to ensure that the recipient of the notice can address the concerns of the sender within the specified time period. Additionally, a 7-day notice form also allows the recipient and the sender to communicate what needs to be done to cater to their issues and needs. Upon receiving the notice, the recipient can immediately inquire about the subject of the notice to the sender, and to provide suggestions or make negotiations. 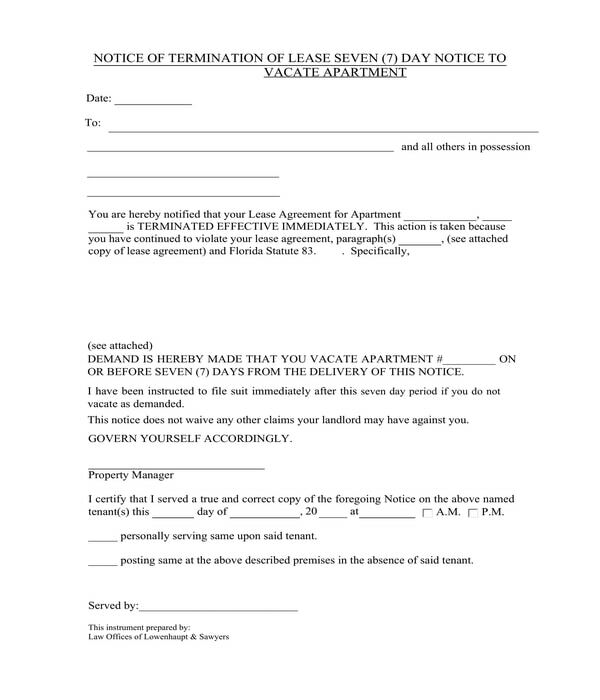 7-Day Lease Termination Notice Form – This variety of 7-day notice form is intended to be used by a landlord or a property owner who rents out his property to a tenant. The objective of the form is to inform the tenant that he is required to move out of the property within seven days from the day that he received the notice. To fill out the form, the landlord must first state the date when he used the form along with the name of the tenant as the notice recipient in the first section. Then, the address of the property where the tenant is mandated to leave will be indicated in the allotted area in the body of the form. The reason for the lease termination is necessary to be explained with specifications of the rules or regulations in the signed lease agreement that the tenant have violated. In addition, the action plan of the landlord which will be executed if the tenant fails to adhere to the requirement of the notice are also included in the form, as well as the details of who served the form, and when the notice form was served to the tenant. 7-Day Notice to Cure Default Form – An agreement default occurs when a party in a lease agreement fails to meet his responsibilities in the duration of the lease. Specifically, a 7-day notice to cure default form is the document that a landlord will use for informing a tenant about the violation and to take action in order to remain in the lease or in the agreement. However, even if the tenant has met the requirements of the landlord, it does not mean that the tenant can repeat the same violation again since it can become a reason for the landlord to mandate a termination. In a 7-day notice to cure default form, the landlord can specify the compliance laws which were not met by the tenant along with the reason why and how the tenant has failed in the stated law. The date when the termination will be taken as an option by the landlord will also be indicated in the form. Moreover, a service form is also enclosed with the notice form to document the date when the notice was sent and received by the tenant, the name of the person who delivered the notice, the method of sending the notice, as well as, the signature of the person who sent the notice to prove that the data stated in the form were true. 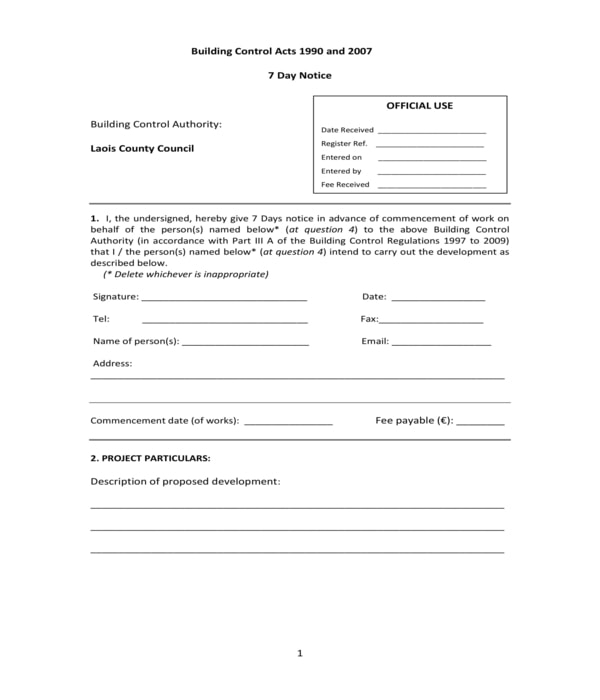 Building Development 7-Day Notice Form – Construction agencies and companies are the users of this type of 7-day notice form. The data to be stated in the first section of form would be the name of the building control authority who is mandating the use of the notice form. In the second section, the details of the construction work to be done in the property along with the contact information of the parties responsible for the work will be enlisted. The third section of the form, on the other hand, is for the particulars of the project such as the description of the proposed development, the planning permission, and the date when it was granted as well as when it will expire, and the location of the project. These details will have to be disclosed by the responsible parties of the building development. The details of the builder, the building owner, and the building designer are also needed to be included in the form which must state their names, addresses, and phone numbers. Lastly, the person who is responsible for providing proof and documents in lieu of the building development will also be stated in with his address, telephone number, fax number, and email. 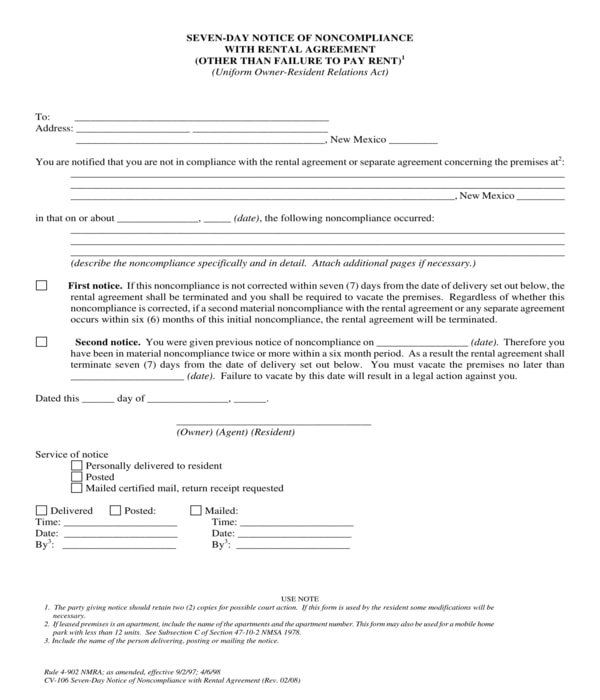 Rental Agreement Non-Compliance 7-Day Notice Form – This form can be used twice by a landlord either as a first notice or a second notice for the tenant. The goal of this form variety is to allow the tenant in knowing about his failure in complying with the rules and obligations defined in the rental agreement that he signed with the landlord. An indication of whether it is the first notice or not will also be stated in the form along with the service information of delivering the notice to the tenant. Regardless of the variety of 7-day notice form to be used, both parties must have a copy of the notice and document their copies along with the agreements that they have signed prior to the notice. This ensures that any disputes and unmet responsibilities will be proven, especially when the court gets involved in the subject of the notice.